The Hotel Barcelo San Jose Palacio is a exquisite hotel with 244 rooms located 15 minutes from the airport and 2km from downtown. It is an ideal place for business and tourists alike situated in a tropical garden and one of the biggest swimming pools in the San Jose area. 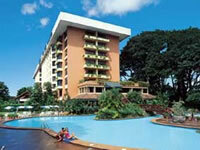 The Hotel San Jose Palacio offers excellent European type service combined with the charm of Costa Rica. An a la carte restaurant and a buffet style restaurant are serving international food while the casino might entertain you after enjoying a good meal. The Hotel Barcelo San Jose Palacio offers 254 rooms including standard rooms, Junior Suites and a Presidential Suites. All rooms are equipped with a mini-bar, air-conditioning, safety deposit box, complete bathroom with hair dryer, cable TV, telephone and voice mail. Guests can take advantage of a full range of leisure facilities that include a Gymnasium, massages, a Beauty Salon, outdoor tennis court, indoor squash courts and a beautifully landscaped swimming pool. The Hotel Barcelo San Jose Palacio offers 254 rooms including standard rooms, Junior Suites and a Presidential Suites.